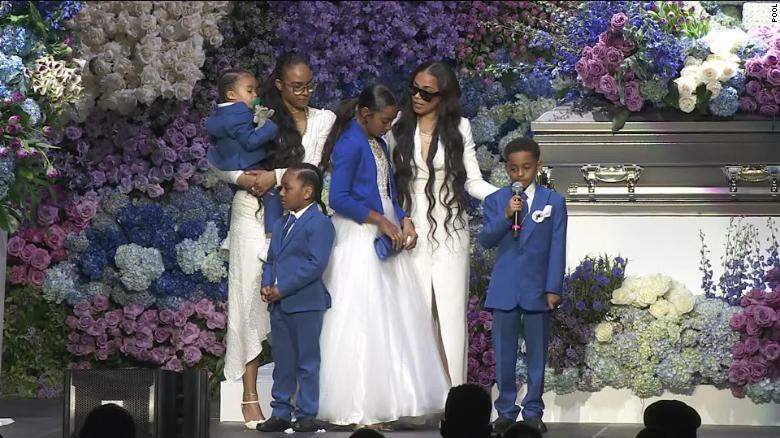 During Nipsey Hussle’s Los Angeles funeral service on Thursday, Snoop Dogg remembered the first time Nipsey “pushed up on me with a tape,” trying to get the world-famous Long Beach rapper to listen to his music. Thousands of fans attended the service, which featured performances from Anthony Hamilton and Jhene Aiko. Snoop Dogg thanked Nipsey Hussle’s parents for bringing him into the world. Karen Civil, Nipsey’s longtime friend and marketing strategist, read the letter from Obama, whose daughters introduced him to Nipsey’s music. The president thanked the rapper for lifting up his South Central Los Angeles community. Hundreds of people lined up on the streets as the hearse with the rapper’s remains made its way by Nipsey’s childhood home and other places that were important to him. Onlookers took pictures of the hearse with their phones as it drove through their neighborhoods. Some rode their bikes while others ran alongside the funeral procession for a final farewell.